The British Museum's "History of the World in 100 Objects" has almost reached its conclusion. Object number 96 was a Russian porcelain plate. It was chosen because it was made in 1901 by the Imperial Porcelain Factory during the last years of the Tsar. However, it wasn't decorated until 1921 when it was, ironically for such an expensive luxury object, painted with symbols celebrating the Communist Revolution of 1917. Furthermore, the plate retained its original imperial seal on the back because the Communist government, strapped for cash during the Civil War, sold most of these plates abroad in order to gain hard currency. 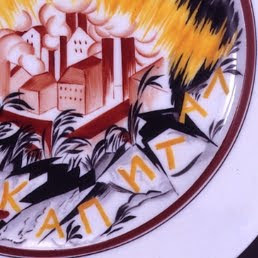 The plate therefore symbolises the rapidly shifting currents in Russian society at that time - it is ironic that the factory where it was made was renamed once again after the fall of Communism - and is once again the Imperial Porcelain Factory. You can download the podcast and read the transcript of the programme about the plate, and the 99 other objects that have been chosen, at the BBC website. David Cameron has announced the results of the Defence Review today, and tomorrow will be the turn of the Spending Review for the other government departments. 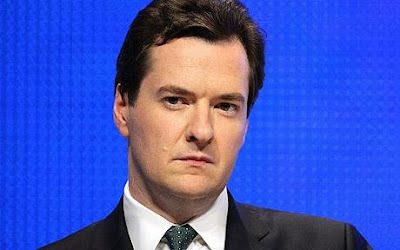 Where do you think the cuts will be made? 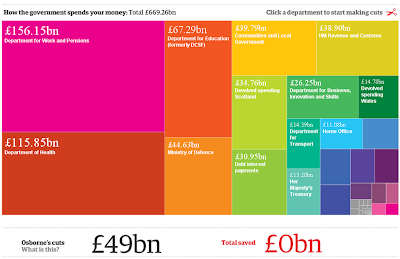 This Guardian graphic gives you a helpful chance to make your own decisions. 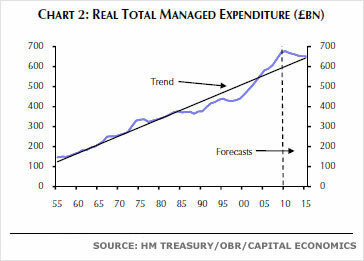 PS: Here is an interesting comment (and graph) from Stephanie Flanders, noting that Government spending willl, depsite the cuts, return to occupying the same share of the economy in 2014 as it did 3 years ago, because the pressure on government expenditure is so great. 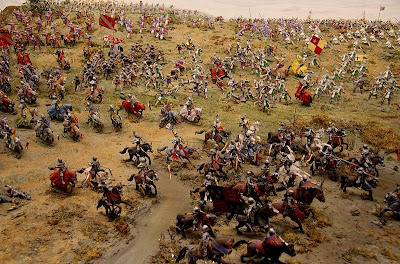 Battle of Hastings - Live! 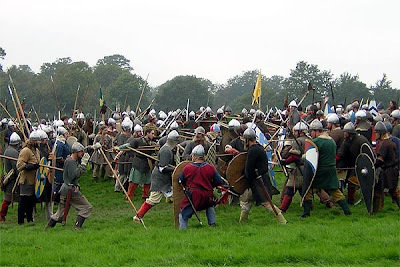 The HP Society will be recreating The Battle of Hastings on Tuesday lunchtime. Come to Room 103 for a briefing and then we'll go out onto the field. Bring suitable clothing! 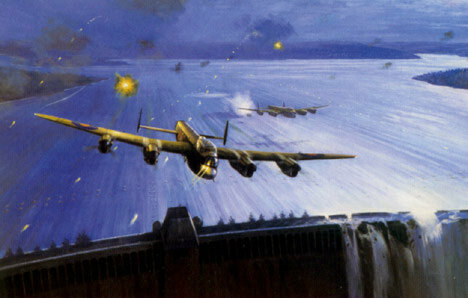 BBC2 showed a programme about the Dambusters on Sunday night. This was the name given to the RAF bombing raid during World War 2 that aimed to destroy German dams (and therefore create massive flooding damage) using special bouncing bombs. The story is well known, particularly because of the 1955 film which celebrated 617 Squadron's achievements. The BBC programme was more reflective. It pointed out some of the factual errors in the film, most of which were designed to make the heroes more sympathetic. In the film Guy Gibson, the squadron leader, is quite easygoing whereas in reality he could be quite aloof and focused on the job. In the film Barnes Wallis, the inventor of the bouncing bomb, comes up with the idea of bombing the dams but faces opposition from the War Office. In reality, the idea had been discussed before war had even begun. The film also gave plenty of time to exploring the effects of the successful destruction of the dams, interviewing Germans who lost their families and houses in the flooding (over 1600 people were killed, many of them allied prisoners of war in labour camps). This tone suggests perhaps that our attitude to events in World War 2 is changing as it moves ever further back into the past and fewer people are alive to remember it (there is now only one remaining veteran Dam Buster). Britain's experience of the war has an important place in our national identity and culture, but a gap of 70 years perhaps allows greater opportunities of a more balanced assessment of its significance. PS: There is plenty of information about the Dambusters around. Here are two examples. The National Archives has an online exhibition of significant documents here. 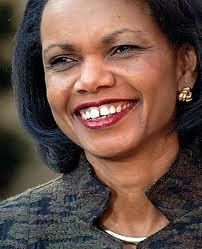 Condoleezza Rice, the Secretary of State and National Security Adviser under George W Bush, has released her memoirs. 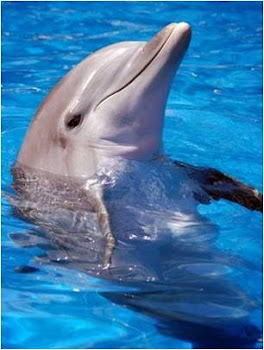 Not yet of the years under Bush, that is due in 2012, but of her childhood and career up to 2000. She grew up in segregated Alabama as an only child of a teacher and preacher and showed enormous talent early on in a wide range of areas from music to academia to ice skating. In 'Extraordinary, Ordinary People' she tells of living with segregation and emerging victorious as well as her parents' experience of the politics and violence that made Alabama the focus of the civil rights battle in the 1960s. It sounds a good read, if criticised for being 'aloof' by the New York Times. Here is an interview with CBS News where she talks about the book. "The Social Network" - the film about Mark Zuckerberg, the creator of Facebook - is released this Friday. As Facebook and social networking in general has becoming an increasingly significant part of our lives (and is beginning to affect political campaigning and lobbying), this blog is certainly curious to know how Zuckerberg's story will be told. Aaron Sorkin, creator of The West Wing, is the chief writer, and although he has "fictionalised" some elements in the interests of drama and legal propriety, Zuckerberg's character and motivation (he created the initial version of Facebook at Harvard as a kneejerk reaction to being dumped by his girlfriend) come across very clearly. Whether this can be classed as a "History" film depends on whether Facebook will last long enough to be considered sufficiently significant, and whether you consider the events of 2003 too close to the present to be reflected on in this way. PS: Here is a review from the Guardian and an interview with Aaron Sorkin. 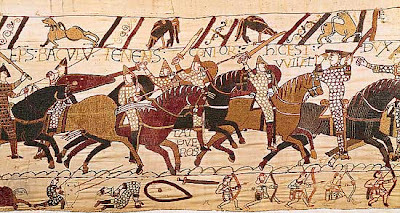 Today is the anniversary of the Battle of Hastings, which took place on 14 October 1066. We are hoping to recreate the battle at school on the field next Tuesday, so keep an eye out for notices! There is plenty of information about the battle available, including these websites this game from the BBC, where you can take on the role of either William or Harold! 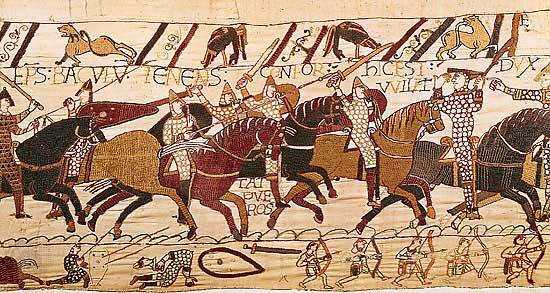 PS: For further posts on the battle from last year, click on the "Battle of Hastings" label below or on the right hand side of the blog. PPS: Here is a short video, courtesy of YouTube - let us know your comments about it! 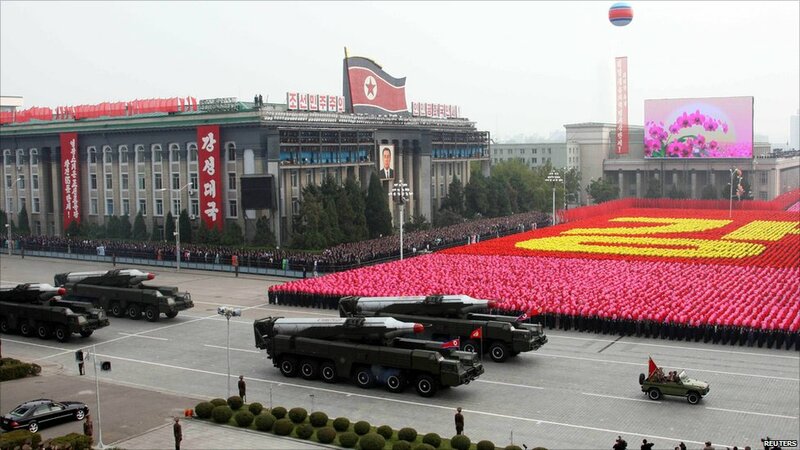 North Korea put on an impressive parade at the weekend, ostensibly to celebrate 65 years of Communist Party rule (since the end of World War 2) but also to bolster the position of Kim Jong Un, Kim Jong Il's youngest son who is being groomed to take over the leadership of the country. The BBC were allowed to witness this and their reporter's observations of life in Pyongyang, the North Korean capital, are fascinating. Here are some more photos of the parade, and a helpful family tree of the Korean leaders. Lord Browne's review of Universities in the UK has been published, and includes the controversial recommendation that the £3290 cap on fees should be scrapped. 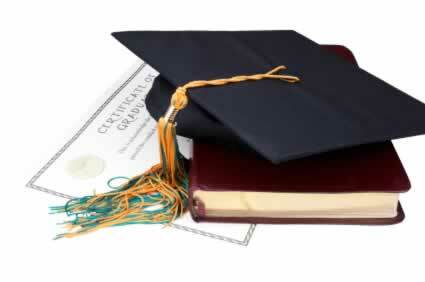 This would allow universities to charge what they like, with the possiblity of fees of up to £12000 a year. Graduates would now not have to start paying this back until their annual salary reached £21000, up from the current level of £15000. Other proposals include the creation of a Higher Education Council to oversee standards, and that lecturers would be required to have teaching qualifications. The proposals will not necessarily be accepted in full by the government, and go clearly against the pledges made by the Liberal Democrats before the election. It will be interesting to see what happens next - what are your views? UPDATE: Vince Cable has suggested that the government may cap fees at £7000 but has endorsed "the main thrust" of the report. This is likely to cause disquiet amongst his Lib Dem colleagues, and can be considered a "rehearsal" for the strains that will follow the announcement of the spending review on 20 October. One final point - Cable says that the reforms will be in place in time for Autumn 2012 - ie the current Year 12 will have to deal with this...any thoughts? 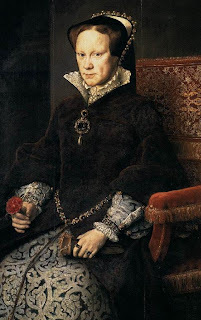 A new website has just been created by the author of the Mary Tudor Blog who has just completed an MA in her studies of Tudor History. It is still under construction, but already has a useful bibliography section allowing you to research in more detail interpretations of different aspects of her reign. If you find other sites that are as helpful as this, please let us know. The beginning of the Supreme Court's new term always brings with it some interesting new cases. None more so than the one they were hearing today - have a look below. Here is a list of the other cases up for review and here is a very useful list of the cases that were considered in 2009-10 and their results. Michael Gove has spoken at the Conservative Party Conference of his intention to overhaul the History curriculum. He attacked the current approach to history teaching, which he said denied children the chance to learn "our island story" in favour of a jumbled mixture of topics. "Children are growing up ignorant of one of the most inspiring stories I know – the history of our United Kingdom," he said. "Our history has moments of pride and shame, but unless we fully understand the struggles of the past we will not properly value the liberties of the present." 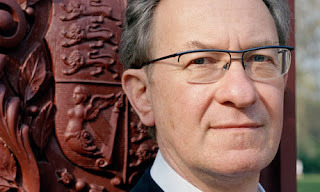 He has asked Simon Schama, the historian who presented the BBC's "The History of Britain" to provide advice on how to instil "excitement and joy" into the curriculum. Schama himself has said, "A return to coherent gripping history is not a step backwards to dry as dust instruction." This is not the first time Gove has spoken on this subject, always a popular topic with the Tories, but it looks like substantial change to the way History is taught will soon be on the way. What do you think, and what do you think should be included? PS: Here is an interview between Simon Schama and David Cameron from the FT Magazine. 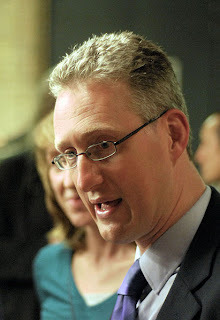 Lembit Öpik, the former Liberal Democrat Member of Parliament for Montgomeryshire, will be speaking at Nonsuch on Tuesday 5 October at 1.15. Everyone is welcome to attend. UPDATE: Thanks for everyone who came this afternoon. It was great to see so many people there and asking questions. What did you think of what he had to say? Please post your comments! Julian Fellowes' new drama on ITV makes great Sunday night viewing - wonderful to look at and well-written, it is also full of familiar faces such as Maggie Smith. It is set in 1912, just before the First World War. This period was looked back on with nostalgia by those who subsequently experienced the War but it was not the idyllic time that it has been painted. See here for ITV's website for previous episodes (2 so far) and background information and here for the Telegraph's analysis of our continuing affection for the era. 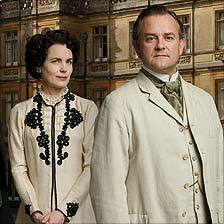 Channel 4 showed an excellent programme last night called "The Genius of British Art". 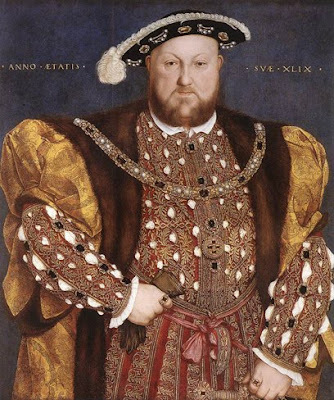 It was presented by David Starkey and focused on royal portraiture, using Hans Holbein's images of the Tudors as its starting point to examine the way portraits have been used to convey power and other messages about the monarch to their viewers. The first 20 minutes are particularly worth watching, with some excellent analysis of portraits of Henry VIII and Elizabeth I. You also get to see Starkey doing an impression of his old university tutor, the famously grumpy Geoffrey Elton. Sunday 3 October was an important day in Germany for 2 reasons. 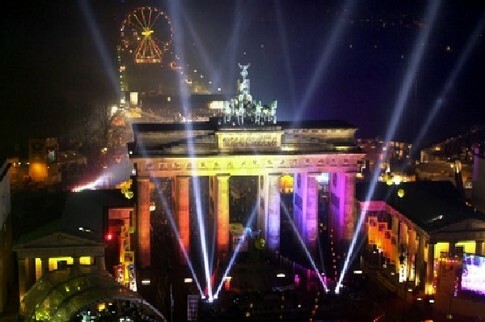 It was the 20th anniversary of reunification, which was marked by an official ceremony in Bremen and other events across the country. However it also is the day that Germany will make its final reparations payment for its debts from the 1st World War, 92 years after the War ended. The reason it has taken so long is that Germany was allowed to wait until it was unified before it needed to pay the final interest charges, a process that was spread out over 20 years. The anniversary has sparked plenty of articles, including this analysis of Germany's changing role in Europe, and this article from Der Spiegel about the behind-the-scenes negotiations between Germany and France 20 years ago. 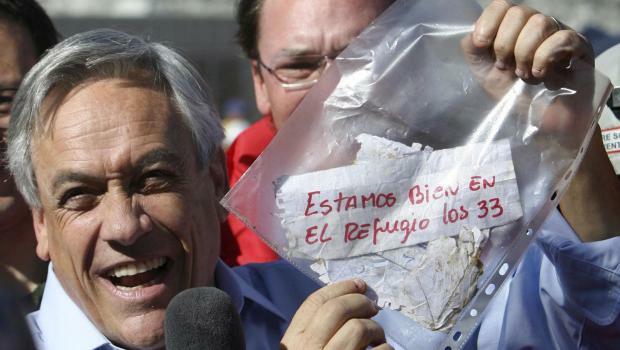 It also contains a useful "road to reunification" timeline.